This coming Sunday (April 14) has two names on our Liturgical Calendar, Palm Sunday and the Sunday of the Passion. In the LC-MS’s first English hymnal (Evangelical Lutheran Hymn-Book) this Sunday was known simply as Palm Sunday. In our second English hymnal (The Lutheran Hymnal) it was known as either Palm Sunday, or the Sixth Sunday in Lent or, Palmarum (which means “Palm”). With the introduction of Lutheran Worship we have added the name “Sunday of the Passion,” which conforms to the trend of Liturgical Church’s around the world. In doing so we also added the long reading from Holy Week, or allowed some truncated form of it. The name “Palm Sunday” (or Palmarum) dates back to fourth century observances in Jerusalem. On this day the faithful assembled on the Mount of Olives and from there went in procession to the city, carrying palm and olive branches and singing, while the bishop rode in their midst sitting on a donkey. It was in the sixth century that the practice of processions with palms came to the West. Throughout this time, the long passion reading, covering the entire week from Palm Sunday through Good Friday was used. This was okay with the people because the lengthy service was the pinnacle of the week, not television, family gatherings, golf games, sleeping in, or whatever. The Introit of the Day, which typically provided the Latin name of the day from its first words or two, reflected this passion tone and so does not begin with the word “palm”. By the time of the Reformation the Liturgical Calendar had become hopelessly complex. Martin Luther, an excellent liturgical scholar in his own right, set about simplifying it. One of those modifications was to make Palm Sunday about Palm Sunday. Therefore the historic processional Gospel reading became the Gospel reading for the day and the passion reading was moved to services throughout Holy Week. This remained the case in Lutheran Churches across the board until the 20th century and the Liturgical Renewal Movement. Throughout this time, Church was a much larger part of everyone’s life. Most of the events read about in the long passion reading were commemorated in worship services throughout the week and people actually went to these services. 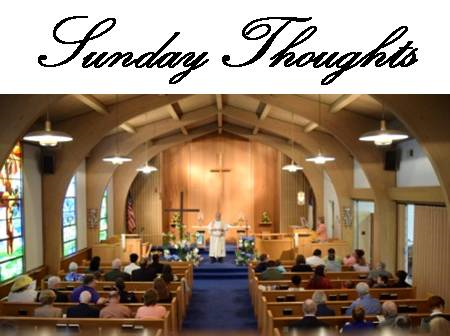 One of the justifications for returning the long passion reading to the Palm Sunday worship service was that people simply were no longer attending Holy Week services. Therefore they went from the celebration of Palm Sunday to the celebration of Easter, skipping over the very reason Easter is so important. This gives a false impression of the Christian Faith. At Our Redeemer we will conform to current liturgical fashion and use both the Palm Sunday reading as our Processional Gospel and the long Passion Reading for our Gospel lesson. The liturgy will be a special one, including a procession from outside with palm fronds at the beginning. Due to the length of the Passion Gospel (two chapters) it has been divided into a responsive reading and the congregation will stand only at the climax. Also pastor’s fifteen to twenty minute sermon will be reduced to a three to five minute meditation. We will be celebrating the Lord’s Supper. Pieces of the standard liturgy will be replaced with hymns. Making comments on the assigned readings would make this post exceptionally long, so below you will find the readings without comment. 5Have this mind among yourselves, which is yours in Christ Jesus, 6who, though he was in the form of God, did not count equality with God a thing to be grasped, 7but emptied himself, by taking the form of a servant, being born in the likeness of men. 8And being found in human form, he humbled himself by becoming obedient to the point of death, even death on a cross. 9Therefore God has highly exalted him and bestowed on him the name that is above every name, 10so that at the name of Jesus every knee should bow, in heaven and on earth and under the earth, 11and every tongue confess that Jesus Christ is Lord, to the glory of God the Father. 22:1 Now the Feast of Unleavened Bread drew near, which is called the Passover. 2And the chief priests and the scribes were seeking how to put him to death, for they feared the people. 3 Then Satan entered into Judas called Iscariot, who was of the number of the twelve. 4He went away and conferred with the chief priests and officers how he might betray him to them. 5And they were glad, and agreed to give him money. 6So he consented and sought an opportunity to betray him to them in the absence of a crowd. 7 Then came the day of Unleavened Bread, on which the Passover lamb had to be sacrificed. 8So Jesus sent Peter and John, saying, “Go and prepare the Passover for us, that we may eat it.” 9They said to him, “Where will you have us prepare it?” 10He said to them, “Behold, when you have entered the city, a man carrying a jar of water will meet you. Follow him into the house that he enters 11and tell the master of the house, ‘The Teacher says to you, Where is the guest room, where I may eat the Passover with my disciples?’ 12And he will show you a large upper room furnished; prepare it there.” 13And they went and found it just as he had told them, and they prepared the Passover. 14 And when the hour came, he reclined at table, and the apostles with him. 15And he said to them, “I have earnestly desired to eat this Passover with you before I suffer. 16For I tell you I will not eat it until it is fulfilled in the kingdom of God.” 17And he took a cup, and when he had given thanks he said, “Take this, and divide it among yourselves. 18For I tell you that from now on I will not drink of the fruit of the vine until the kingdom of God comes.” 19And he took bread, and when he had given thanks, he broke it and gave it to them, saying, “This is my body, which is given for you. Do this in remembrance of me.” 20And likewise the cup after they had eaten, saying, “This cup that is poured out for you is the new covenant in my blood. 21But behold, the hand of him who betrays me is with me on the table. 22For the Son of Man goes as it has been determined, but woe to that man by whom he is betrayed!” 23And they began to question one another, which of them it could be who was going to do this. 24 A dispute also arose among them, as to which of them was to be regarded as the greatest. 25And he said to them, “The kings of the Gentiles exercise lordship over them, and those in authority over them are called benefactors. 26But not so with you. Rather, let the greatest among you become as the youngest, and the leader as one who serves. 27For who is the greater, one who reclines at table or one who serves? Is it not the one who reclines at table? But I am among you as the one who serves. 28 “You are those who have stayed with me in my trials, 29and I assign to you, as my Father assigned to me, a kingdom, 30that you may eat and drink at my table in my kingdom and sit on thrones judging the twelve tribes of Israel. 54 Then they seized him and led him away, bringing him into the high priest’s house, and Peter was following at a distance. 55And when they had kindled a fire in the middle of the courtyard and sat down together, Peter sat down among them. 56Then a servant girl, seeing him as he sat in the light and looking closely at him, said, “This man also was with him.” 57But he denied it, saying, “Woman, I do not know him.” 58And a little later someone else saw him and said, “You also are one of them.” But Peter said, “Man, I am not.” 59And after an interval of about an hour still another insisted, saying, “Certainly this man also was with him, for he too is a Galilean.” 60But Peter said, “Man, I do not know what you are talking about.” And immediately, while he was still speaking, the rooster crowed. 61And the Lord turned and looked at Peter. And Peter remembered the saying of the Lord, how he had said to him, “Before the rooster crows today, you will deny me three times.” 62And he went out and wept bitterly. 63 Now the men who were holding Jesus in custody were mocking him as they beat him. 64They also blindfolded him and kept asking him, “Prophesy! Who is it that struck you?” 65And they said many other things against him, blaspheming him. 6 When Pilate heard this, he asked whether the man was a Galilean. 7And when he learned that he belonged to Herod’s jurisdiction, he sent him over to Herod, who was himself in Jerusalem at that time. 8When Herod saw Jesus, he was very glad, for he had long desired to see him, because he had heard about him, and he was hoping to see some sign done by him. 9So he questioned him at some length, but he made no answer. 10The chief priests and the scribes stood by, vehemently accusing him. 11And Herod with his soldiers treated him with contempt and mocked him. Then, arraying him in splendid clothing, he sent him back to Pilate. 12And Herod and Pilate became friends with each other that very day, for before this they had been at enmity with each other. 18 But they all cried out together, “Away with this man, and release to us Barabbas”— 19a man who had been thrown into prison for an insurrection started in the city and for murder. 20Pilate addressed them once more, desiring to release Jesus, 21but they kept shouting, “Crucify, crucify him!” 22A third time he said to them, “Why? What evil has he done? I have found in him no guilt deserving death. I will therefore punish and release him.” 23But they were urgent, demanding with loud cries that he should be crucified. And their voices prevailed. 24So Pilate decided that their demand should be granted. 25He released the man who had been thrown into prison for insurrection and murder, for whom they asked, but he delivered Jesus over to their will. 44 It was now about the sixth hour, and there was darkness over the whole land until the ninth hour, 45while the sun’s light failed. And the curtain of the temple was torn in two. 46Then Jesus, calling out with a loud voice, said, “Father, into your hands I commit my spirit!” And having said this he breathed his last. 47Now when the centurion saw what had taken place, he praised God, saying, “Certainly this man was innocent!” 48And all the crowds that had assembled for this spectacle, when they saw what had taken place, returned home beating their breasts. 49And all his acquaintances and the women who had followed him from Galilee stood at a distance watching these things. 50 Now there was a man named Joseph, from the Jewish town of Arimathea. He was a member of the council, a good and righteous man, 51who had not consented to their decision and action; and he was looking for the kingdom of God. 52This man went to Pilate and asked for the body of Jesus. 53Then he took it down and wrapped it in a linen shroud and laid him in a tomb cut in stone, where no one had ever yet been laid. 54It was the day of Preparation, and the Sabbath was beginning. 55The women who had come with him from Galilee followed and saw the tomb and how his body was laid. 56Then they returned and prepared spices and ointments.